Although most people develop and grow 32 permanent adult teeth, many times their jaws are too small to accommodate the four wisdom teeth. Often these teeth are malpositioned. 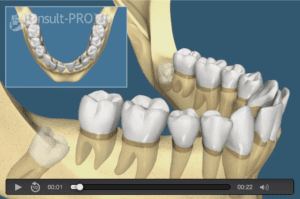 Teeth are called “impacted” if they have not erupted into normal position. Often there is inadequate space for them to erupt into the proper position for chewing and cleaning. If wisdom teeth cannot be kept clean they tend to develop infection in the gum tissue about them. 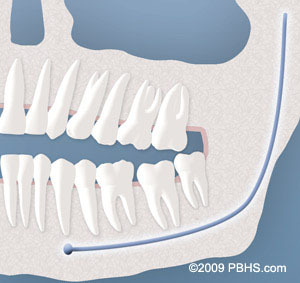 Many patients are confused about what constitutes an impacted tooth. 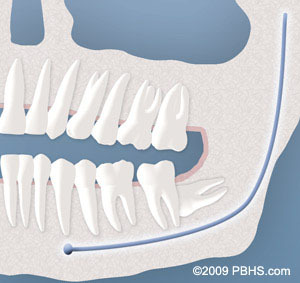 Most patients believe it is a tooth that is in a sideways position in their jaw. An erupted third molar is one that is completely visible in the mouth and is not covered by bone or soft tissue on the back aspect of the tooth. An impacted third molar is one that is still covered partially or totally by soft tissue and/or bone. We will need to see you for an evaluation to determine if you will benefit from wisdom tooth removal. A special x-ray of your mouth and jaws (panorex) will be taken to determine if your wisdom teeth are impacted, if there is room for them to erupt, and how difficult it will be to have them removed. In some cases we may suggest that we take a CT scan of the jaws if the wisdom teeth are close to a nerve or if pathology is present about the wisdom teeth.